Sanctuary 2017 is located on the A712, 7 miles from Newton Stewart in Dumfries and Galloway. The site runs on each side of a small road. On one side is Murrays Monument and the HQ of The Dark Outside FM (a 5 minute walk to the top – great views) and known as the ‘upstairs’ of Sanctuary. ‘Downstairs’ there is a short walk to The Grey Mares Tail, a waterfall where you’ll find this years video installation. On the other side of the road, spread out along the valley are arrtworks and installations including Sanctuary’s 100 ft neon sculpture. 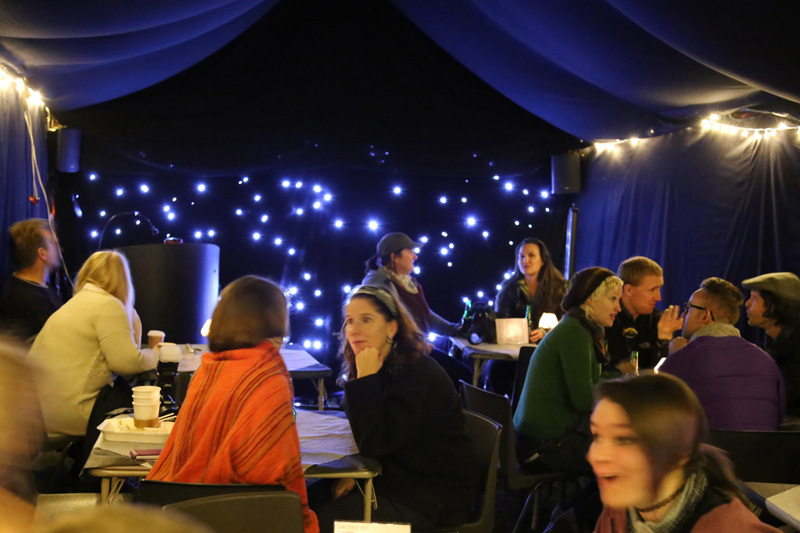 There is also a central information point at The Dark Star Lounge, The Dark Inside Venue, foodstalls, fires to warm yourself by in the evening and campsite. The event is very friendly. Please get involved; talk to people, ask questions, add your ideas and thoughts, help out……. Camping: There is plenty of space for camping for both tents and camper vans.If you want to camp please bring water and provisions.There are temporary toilets and water (not drinking) onsite. Please bring drinking water. We will be asking for donations for camping – suggested £5 per person. Thankyou in advance for your support. The event starts at noon, but you are welcome to come and pitch your tent from 11am. Food: There are food stalls on site serving food on Saturday and Breakfast on Sunday. Please note there is limited mobile reception. Sanctuary takes place in the Galloway Forest Dark Skies Park and we keep lighting to a minimum to preserve the essential nature of the park. Sanctuary’s signature installation will be lit from 8-12pm only. Please remember to bring a torch. Torch – It gets very dark. Really dark. Suitable shoes – theres a steep path to the Dark Outside HQ. The rest is easier going – paths or grass.